Credit markets remain stalled despite heroic efforts by global central banks, regulators and governments to restore confidence in the financial system. A lack of liquidity has made issuing new high-yield bonds almost impossible for companies. 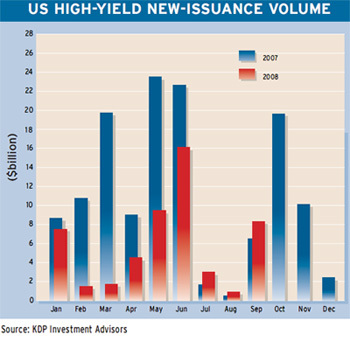 Kingman Penniman, president and chief executive of Montpelier, Vermont-based high-yield bond research firm KDP Investment Advisors, says the $5.1 billion of new issues in the US high-yield market in the third quarter of 2008 was the lowest on record for any three-month period. “In last year’s fourth quarter, $32.2 billion of bonds priced, more than six times what sold in the quarter that just ended,” Penniman says. 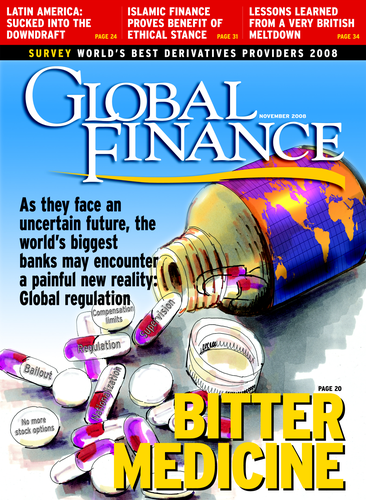 As Global Finance went to press, the US Treasury Department was considering taking ownership stakes in many US banks to strengthen their balance sheets and convince them to resume lending. This followed a coordinated move by central banks around the world, including the Federal Reserve, the European Central Bank and the Bank of England, to cut their main lending rates by a half percentage point. The Fed doubled the size of its term auction facility under which it lends money to banks for up to 85 days at a time, to $300 billion. In addition, the Fed announced the creation of the Commercial Paper Funding Facility (CPFF) to complement its existing facilities to pump liquidity into the markets. The CPFF will provide a liquidity backstop to US issuers of commercial paper, including financial institutions as well as corporations. “The commercial paper market has been under considerable strain in recent weeks as money market mutual funds and other investors, themselves often facing liquidity pressures, have become increasingly reluctant to purchase commercial paper, especially at longer-dated maturities,” the Fed said in announcing the new facility. “As a result, the volume of outstanding commercial paper has shrunk, interest rates on longer-term commercial paper have increased significantly, and an increasingly higher percentage of outstanding paper must now be refinanced each day,” it added. The CPFF will be structured as a credit facility to a special purpose vehicle (SPV) authorized under section 13(3) of the Federal Reserve Act, which applies to unusual and exigent circumstances. The SPV will purchase directly from eligible US issuers three-month dollar-denominated commercial paper at a spread over the three-month overnight index swap rate. Total commercial paper outstanding fell by $56.4 billion in the week ended October 8, to $1.55 trillion. The decline was the fourth in as many weeks. Commercial credit continues to deteriorate, and while regional US banks are still experiencing relatively low loss levels in their business lending, these losses are expected to accelerate toward, and potentially exceed, historical peak losses over the coming quarters, according to a report by Arlington, Virginia-based FBR Capital Markets. “Compounding potential credit problems is the current liquidity crisis, which is making it harder for businesses to fund their operations, therefore decreasing the likelihood that many businesses will be able to earn their way out of the current down cycle,” the report says.